Set amid the promise and challenge of the first Canadian colonies, Aimie K. Runyan’s vividly rendered novel provides a fascinating portrait of the women who would become the founding mothers of New France. In 1667, an invisible wall separates settlers in New France from their Huron neighbors. Yet whether in the fledgling city of Quebec or within one of the native tribes, every woman’s fate depends on the man she chooses—or is obligated—to marry. "People are capable of far more than they give themselves credit for. Once you start on the impossible journey you'll be amazed at how far you travel." I think I am starting this review the same way I started the previous book, Promised to the Crown, by stating my love of Canadian historical fiction. It's a location as well as a time period not easily found. I was super excited when book one was first released in May and that I didn't have to wait long for book 2 (hopefully there will be a book 3). Where book one introduces us to Rose, Nicole and Elizabeth, their journey and introduction to New France, Duty to the Crown continues in 1667 focusing on Claudine Deschamps, Gabrielle Giroux and Manon. Though this book does work as a standalone I highly recommend starting with book one, the journey that was originally made as well as the connections will further enhance the enjoyment of this one. 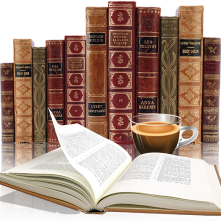 The author's writing style made it very easy to get lost in this story. While these three young women come from totally different life styles and social classes they form a special bond through the trials that women faced during this time period. They lives aren't their own, with little rights and the ability to decide their own future. This special friendship was conveyed in a believable and unique manner making this reader connect not just with those 3 women but others in this book as well. Duty to the Crown is a wonderful story of friendship, heartache and family - whether blood related or not. With its many layers and different story lines it was easy to visualize the setting and feel the emotional part of this book. A compelling story steeped with rich details brought the time period to life. 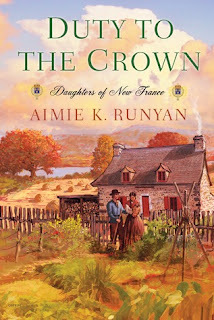 While the conclusion was fitting my connection had me wanting to read more and can only hope that the Daughters of New France series continues in book #3.